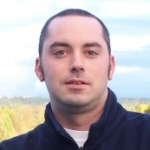 Robert Cruickshank is a Doctoral Candidate at the University of Washington in Seattle. His dissertation, “Our San Francisco: Race, Liberalism and the Reconstruction of Urban Space, 1950-1980” examines the role of African Americans and other groups in creating a neighborhood-based politics that restructured the way San Francisco was governed in an attempt to overcome decades of persistent racial inequalities. A recipient of the York-Mason Award for Best Graduate Student Paper on African Americans in the American West in the Department of History, Robert received his M.A. in history from the University of Washington in 2003, and his B.A., also in history, from the University of California at Berkeley in 2000. He currently lives in Monterey, California.